Hundreds of police officers have gone on parade to celebrate the 175th anniversary of the Metropolitan Police. 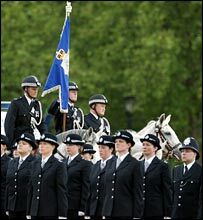 Officers from the mounted section, diplomatic protection, dog handlers and the mobile catering unit were among those on Horseguards Parade in London. 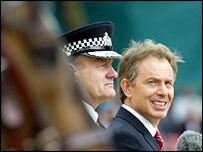 Commissioner Sir John Stevens addressed officers and the audience of 6,000, including Prime Minister Tony Blair and mayor Ken Livingstone. Sir John told officers: "You are among the everyday heroes of this city." He said the job had changed a lot since he joined the police, with new challenges such as international terrorism and sophisticated organised crime. "I'm coming up for my 43rd year now and the job is different in a major way. The pressure's in the job, the accountability, and what is expected of the police to deliver. "I think the quality of the police officer and the organisation is far higher than when I joined. I would be lucky to get in now." Vintage cars and former commissioners and officers - including George Breening, 97, who served from 1929 to 1954 - were also at the parade. The former station sergeant, from Wimbledon, south-west London, said: "I wouldn't say it is any different. We all went through the same training, we all had the same ideas. I am proud of them. " The original Peeler's outfit, with its reinforced top hat so officers could stand on it to see over walls, was among old uniforms modelled by volunteer cadets. The Dog Section is celebrating its 50th anniversary and the Met is also using the event to celebrate reaching 30,000 officers in the London force. Sir John presented the Mounted Branch with its new guidon, or pendant, which will be carried from now on at ceremonies. He added: "It remains my vision to make London the safest major city in the world and I know that future generations of Met officers will still be giving their utmost in pursuing the same aim another 175 years from now."